Continuing our awards week at PFF, it’s time to turn to the one award we give for an entire unit, rather than an individual, and give some kudos to the best offensive line in football. This year, the best line in the game was the Philadelphia Eagles, despite losing one of the best left tackles in the league to injury mid-way through the year and replacing him with one of the worst. The Eagles’ unit boasted some of the top performers at their respective positions, and as much as they downgraded at left tackle during the year, they upgraded at left guard when they sent Week 1 starter Isaac Seumalu to the bench and replaced him with veteran Stefen Wisniewski. While Seumalu gave up four sacks and four more total pressures in two starts, Wisniewski allowed just one sack all season and 11 total pressures. This line looked good on paper heading into the year, but there was some projection in that, and the turnaround of Jason Kelce at center has been remarkable. Coming off a year that saw him earn his worst grade in five seasons, he hasn’t just got back to his previous high level of play, but he has actually exceeded it and had a career year in the middle of the line. His run-blocking grade in particular was phenomenal – a 97.9 mark that wasn’t just the best run-blocking grade at center this season but also the best run-blocking grade at any position this year. In fact, it edged Evan Mathis back in 2013 for the best run-blocking seasonal grade we have ever given at any position in over a dozen years of grading. Kelce’s pass protection wasn’t amazing this season, and actually a little below average, but centers have such few true action plays in pass protection – typically they are more help players than one-on-one pass blockers – that it was a huge net win for the Eagles. The right side of the line was dominant, with Brandon Brooks and Lane Johnson forming the best duo on that side of the ball in the league. Brooks was once again one of the game’s best guards, and he only missed out on a spot on PFF’s second-team All-Pro by virtue of being the third-best right guard this year. He was the fourth-best guard overall at the end of the regular season. Brooks didn’t allow a sack all year, and he still hasn’t two games into the playoffs. He surrendered just 17 total pressures across 16 games and if anything, his run-blocking was even more dominant. Johnson alongside him is consistently one of the best tackles in the game. He allowed three sacks and 20 total pressures over the year, checking in with the third-best pass-blocking efficiency of any tackle at 97.2. That leaves the only problem spot – left tackle. Jason Peters was one of the best tackles in the game before he went down injured, allowing just seven total pressures in seven games, and this would have been a runaway victory for the Eagles line had he stayed healthy all season. Replacing him with Halapoulivaati Vaitai was always going to be a significant downgrade, but it’s worth illustrating just how significant it was. Vaitai surrendered nine sacks and 30 additional pressures across the regular season, and while Peters bowed out with an overall PFF grade of 86.4, Vaitai had an overall grade of just 39.1, which ranked 74th in the league. Even with Vaitai struggling for half of the season though, the other four members of the Eagles line were so good that they ended the year as the best line in the game. The other contenders on paper heading into the season struggled more than what was expected, and there was no complete unit to really challenge them. This line is a huge reason that the Eagles’ season was not done the moment Carson Wentz tore his ACL and was shut down for the season. They are more than good enough for this team to still deploy a powerful ground game and open holes for players like Jay Ajayi and LeGarrette Blount, as well as keep Nick Foles upright and able to execute the game plan without a huge amount of duress. 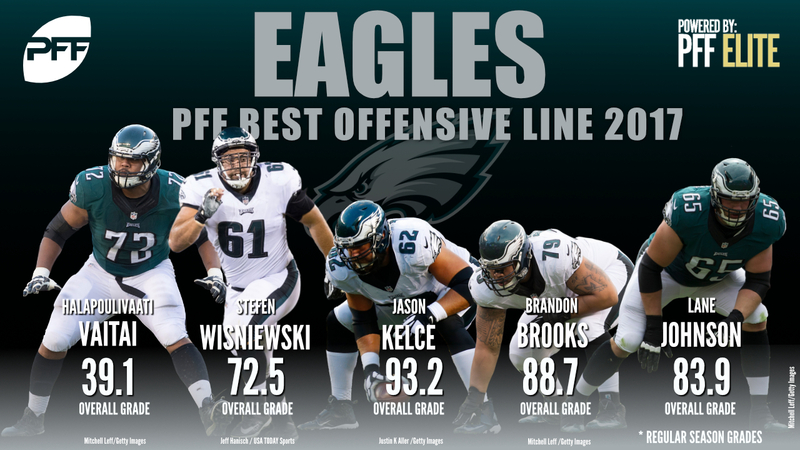 The Philadelphia Eagles were the best offensive line in football in 2017.